First published in French as Yallah Bye in France by Dargaud Lombard in January 2015. English language translation by Montana Kane published in France by Europe Comics in July 2017. Another scary read for October, this one a graphic novel exploring the terrifying experiences of a French family trapped in the Lebanese city of Tyre when it is bombarded by Israeli forces. The story begins happily with twenty-year-old Gabriel waving goodbye to his family at Charles de Gaulle airport before returning home whereas his friends are awaiting a parent-free party! As the family arrive in Lebanon however, two images of a burning tank indicate that something is very wrong. I loved Park's artwork throughout this novel. The illustrations vividly depict facial emotions while also building up extremes of tension ib both Lebanon and France. The repeated text indicators of telephones ringing and fighter jets approaching are particularly effective, especially when interspersed as they are with the frequent boum of bombs exploding. I read Yallah Bye through almost completely without stopping because I was so gripped by the story. I appreciated that Park uses different colour palettes to indicate French or Lebanese scenes, and also works in a monochrome for scenes set some twenty years in the past - although I didn't fully realise the connection of that third narrative until quite near the end of the graphic novel. What was most moving for me was the fatalism of the Lebanese people. Several of the characters independently reassure Anna (the French mother) that the hostilities will fade because this happens frequently and they are used to it. I can't imagine ever becoming so inured to daily bombardment, the violence and privations. Also thought-provoking is the lack of reaction to Gabriel's attempts to stir up outrage back in Europe. No one seems to care and even news reports are curtailed in favour of inane sports chat. 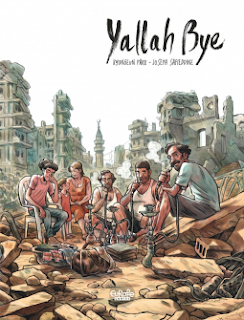 Yallah Bye doesn't attempt to explain why Lebanon is so frequently attacked or the history of the situation, instead focussing on the immediate experiences of Gabriel's family to tell a striking story. I loved that this story was presented as a graphic novel. It worked so well. I'm embarrassed that I was so snooty about graphic novels for so many years!